SIS LIVE DriveForce: Outside Broadcast satellite uplink. 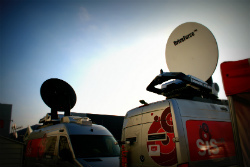 Milton Keynes, 18th February 2013: Outside broadcast, satellite uplink and product design specialist SIS LIVE announces the deployment of its new 1.8m vehicle mounted antenna DriveForce®. DriveForce delivers high bandwidth transmissions with the ability to transmit at any location including those, like links golf courses, where exceptionally windy conditions prevail. SIS LIVE is currently operating a new dedicated DriveForce SNG truck for Sky and has launched an additional 6 DriveForce vehicles to support Sky Sports News and other news and sport customers. 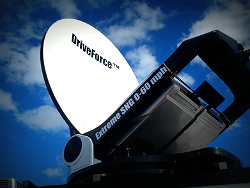 The DriveForce system has already received tremendous feedback from operators and clients. With increasing demand for high bandwidth HD transmissions, many existing systems use mounts developed for small aperture antennas, bolstered to take a larger reflector, thus compromising the design. With DriveForce, SIS LIVE have adopted a ‘grass roots’ approach, ensuring that the mount is optimised to carry the large antenna and capable of operating in wind speeds of up to 60mph, almost double that of competing products. The ultra-high performance carbon fibre system is fully automated, capable of very high bandwidth or dual path transmissions and incorporates SIS LIVE's award-winning differential antenna control technology to find and track any satellite within seconds. SIS LIVE has invested heavily in accurate tooling and high quality, low tolerance manufacturing processes, ensuring optimal quality and performance of its antennas. This significant investment has enabled the development of units which feature high levels of integration and are extremely lightweight due to the extensive use of composite materials.